Khaled Mashaal invited to Cairo for cease-fire talks, expresses support as long as 'conditions' are met. Hamas has received an "invitation" for cease-fire talks in Cairo on Sunday, the terror group announced, and would consider participating in the Egypt-brokered initiative - under certain conditions. Hamas "received an invitation, through mediators, for a delegation headed by (chief-in-exile) Khaled Meshaal to visit Cairo and discuss the Egyptian initiative," it said in a statement. It said the Islamist movement's "response was that its position on the initiative is known, but it is at the same time ready to cooperate with a move by any party that will achieve the specific Palestinian demands." An Egyptian foreign ministry official said he could not confirm or deny the new invitation. Hamas categorically rejected attempts for a cease-fire on multiple occasions in the thirteen days since Operation Protective Edge began, insisting that the terms of the agreement 'did not apply' to them and taking issue with the Egyptian mediators at the heart of international peace efforts. Later, Hamas officials reportedly set a series of unprecedented demands on Israel to accompany a ten-year truce - before threatening Israelis if the government refused to accept. Mashaal, as well as Hamas, have openly encouraged escalation this week, declaring that Israel is "doomed to fail." 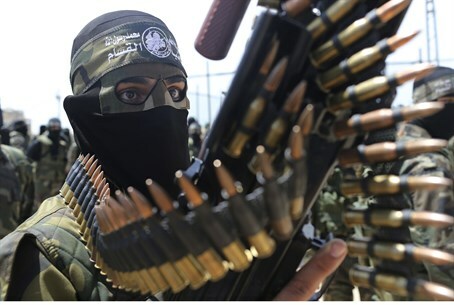 And on Thursday, a Hamas spokesman in Gaza stated that "Israel will pay a high price" for launching the ground operation and that Hamas "is ready for the confrontation." "With this action the Israeli government seeks to restore the morale of its soldiers and the morale of its army leadership - a leadership that is collapsing because of the qualitative blows of the resistance,” the spokesman, Fawzi Barhoum, claimed. Egypt, under recently-elected President Abdel Fattah al-Sisi, has moved to isolate Hamas, accusing it of backing the Muslim Brotherhood on its own territory. Egypt's foreign ministry has condemned Israel's ground offensive but it also lashed out at Hamas, saying the Islamist movement could have saved dozens of lives had it accepted Cairo's proposal. According to Kol Yisrael radio, the Egyptian government said it was placing the responsibility on Hamas for “the possible deaths of Palestinian civilians”, citing Hamas’s refusal to accept Egypt’s proposal for a ceasefire. The report quoted Egypt’s Foreign Minister, Sameh Shoukry, as having said that had Hamas accepted the ceasefire proposal, it would have saved the lives of at least 40 Gazans who were killed in Israeli airstrikes. Shoukry further said that Hamas was cooperating with Qatar and Turkey to harm Egypt’s status in the region. Shoukry’s comments on Hamas echo those made earlier by Egypt’s former Foreign Minister, Mohammed Al-Arabi, who said that Hamas was not serious about a ceasefire – and that the terror group was deliberately trying to embarrass Egypt. Speaking in an interview in an Egyptian newspaper, Al-Arabi blamed Hamas for not only failing to come to a ceasefire, but for “shedding the blood of innocent Palestinians” by continuing to attack Israel. Tensions between Egypt and Hamas may have been pushed aside, however, by the Palestinian Authority (PA)'s encouragement for Hamas to take the cease-fire deal - citing, among other things, the specific desire to hurt Israel. "Israel accepted the ceasefire proposal. We (the Palestinians) must also accept it so that we can put the Israeli side at unease," Abbas told a news conference with Turkish President Abdullah Gul in Istanbul in comments translated from Arabic into Turkish. A senior official in the terrorist Palestine Liberation Organization (PLO), the group behind Abbas's Fatah party, said in an interview on official PA television that Ramallah has recognized - and legitimized - Hamas's unprecedented demands. "These are also our demands," Yasser Abed Rabbo said. "If Gaza is broken, all Palestinians will be broken." Abbas and Mashaal are meeting in Qatar Sunday to discuss a possible cease-fire deal.